As I sit shotgun in the van on the way home from our Spring Break mission trip to Mexico I just started reflecting on what made this trip so amazing. Yes, the sixteen minute border wait on the way home will make you smile, but did we do right that made our team smile the entire trip? Having been able to do multiple mission trips since being a Christian here are some things that our team has implemented into the trip to make it more successful (maybe one day I will write something on “How not to lead a mission trip” but not this year). This year we started plenty ahead of time. This allows the students, adult leaders and families in your church who want to come the ability to come. Most people want/need ample lead-time before the trip to get prepared; respect that and plan ahead so that you are prepared. When you are prepared then everyone on the team can be prepared. This will allow you the time to think when the plans need to change and trust me they will. When you know who this trip is aimed to, what people can expect, what kind of work you will be doing and things of that nature it helps you know who this trip is designed for. If you are going to be building a building then you may not want younger kids on the team. Know your sleeping arrangements so that people can know what to expect and what they need to bring. Also if you have a dad who wants to bring his eight-year-old daughter on trip are you prepared for that with the sleeping? These are great things to think through ahead of time. This is where you need to be prepared so that you can communicate what is necessary for the people on your team to know. If the meeting is going to be an hour long be prepared for that, if the meeting is going to be three hours long let your team know that ahead of time. This is a great time to read Exodus 18 again. Look at what Jethro says to Moses about the way he is leading. Appoint leaders on your team and let them lead. Teach your leaders to lead, help them lead and let the team know that they are going to lead. This has been one the greatest learning experiences for me. When you can focus your time on helping your leaders and taking care of them, then your leaders can lead; us the resources in them that God has given you. This could probably be the first point but we’re talking about it last. Pray throughout this entire process; pray for God to put the right people on the team. Pray for God to lead your team, stretch them, keep them safe and unite them for a common purpose. When you take the time to seek God in this entire process of following the great commission God will speak to you and lead you in the right path. So the long awaited footage is here! This is what my small group did the day after it snowed in Vegas! I am so stoked I got some guys who are down to do this! Yep, that is right! So do you ever have those nights that small group is just not going that well and things keep getting in the way? This was one of those nights. It could have been me, or maybe my boys, but none of us were focused and then Bobby found the blowdart gun. He kept asking to shoot me and finally I gave in... but then I shot him; once when he was ready and once when he wasn't for good measure! 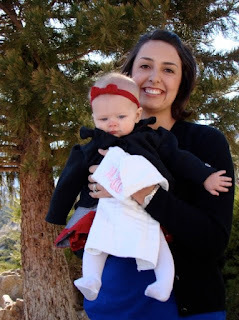 So this post is long overdue but I have been slammed in life lately. About 2 weeks ago I had the rad opportunity to do the wedding of two of our really good friends here in Las Vegas; Greg and Richelle. 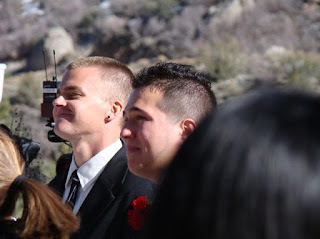 Greg and Richelle got married up at Mount Charleston and it was the most beautiful day that I have ever been up there. 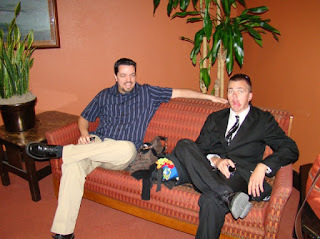 Here is Greg and I waiting for Richelle to come down the isle. Greg is one of the first people that I met out here in Vegas and I have to say that he has been a great friend to me. The first time I met Greg he was driving his sick Chevy Nova and the plate read "SXI MXI" short for sexi mexi; and that is what Greg is. Then Richelle and Greg both started working with students out here with us at South Hills Church. Now I have to put up this picture of Dana Bicker with Sophie. Ryan and Dana used to work out here at South Hills and now they are living back in the Bay Area. We totally miss them! Ryan actually sent me these pics (love them Rhino!). Here is Ryan and I chilling at the reception waiting to get in. I had to put this one up there because you will rarely see me in a suit! I love rocking the suit, but I cant do it all day. This post can sum up as being about friends. Charity and I have been blessed with having some great friends in our lives; thank you to all who we call friend. 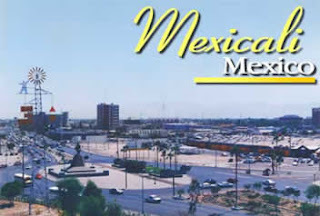 Yesterday we drove into Mexicali Mexico. I am apart of a team that will be here for 8 days working with Rick and Tammie Romano. Our goal is to work as a team to unite people to find Jesus while we are here. During that process we hope to build a church! I am in Mexico right now so this is going to be short. Please take the time to pray for our team and that God will lead all we do! Matt Hall is our building team leader and Whitney Rossvanes in leading VBS. They are amazing! I'll try to update this... key word in there is try!